This project proposal focuses on reinforcing controls against poaching and illegal trade in bush meat inside and within the periphery of the Campo Maían National Park (CMNP) in order to reduce exposure of the elephant to risks from human encroachment and poaching. This projectís prime objective is to strengthen capacity of the wildlife service to manage elephant populations, through training and equipment of game guards, improvement in planning and execution of anti-poaching patrols, and conceptualization and implementation of information, education and communication programs to enable increased elephant related environmental awareness of local communities and other stakeholders. 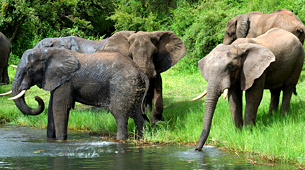 * Increased awareness of local populations and key actors in poaching issues and wildlife conservation laws and policies.